A student presents her research poster. The presentations are an opportunity to discuss the topics the students chose to focus on for their projects. A group of students talk about a research poster. UPPF provides opportunities for students to do in-depth explorations of topics that matter to them. A UPPF student explains his research poster. The UPPF Research Symposium takes place each spring. 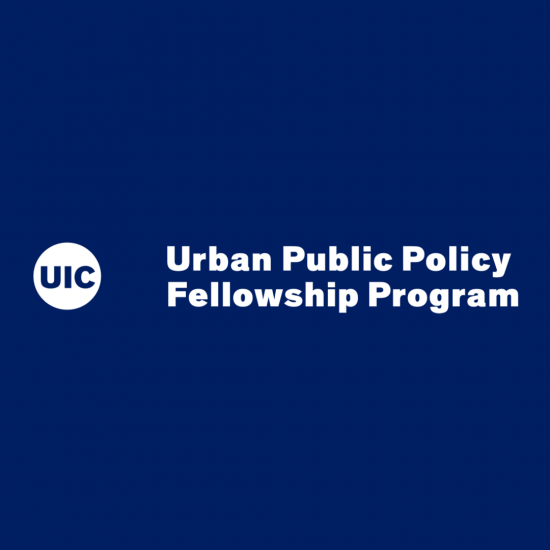 The Urban Public Policy Fellowship (UPPF) program is a leadership development program designed to expose historically underrepresented minority undergraduate students at the University of Illinois at Chicago to key public policy issues. The program provides Fellows with seminars covering the areas of public policy-making, advocacy, community development, and service provision, and a valuable internship experience. Students from all academic areas are eligible, including those with an interest in fields such as education, urban planning, political science, sociology, urban health, communication, and law. Upperclassman standing (minimum 45 hours) is necessary to participate in this non-degree, non-credit program. UPPF Fellows are selected through a highly competitive process that considered grade point average, history of engagement, and leadership experience. Each Fellow has been assigned an internship service and is participating in seminars, workshops, and other activities designed to expose him or her to the theory and practice of public policy-making, advocacy, community development, and service provision. Fellows will be required to conduct public policy research projects and make public presentations on their projects at the end of the semester. The goal of the program is to pair fellows with partner organizations who can provide students with insight into the inner-workings of government, community-based initiatives, non-for profits, and public policy. Fellows identify, research, and develop a public policy project guided by a research question that enhances their internship experience with partner organizations and are given the opportunity to present their public policy projects at an annual research conference. The UPPF Program is administered by IPCE in partnership with the African American Academic Network (AAAN) and the Latin American Recruitment and Educational Services program (LARES). The applications for the 2019-2020 Urban Public Policy Fellowship Program are now live! The UPPF program is a leadership development program designed to expose historically underrepresented minority undergraduate students at the University of Illinois at Chicago to key public policy issues. The program provides Fellows with seminars covering the areas of public policy-making, advocacy, community development, and service provision, and a valuable internship experience. Meet our current cohort of UPPF Fellows! The UPPF program is now in its tenth year, and 197 historically underrepresented students have completed it. Recent alumni from this program have been accepted into policy-related graduate programs and have been employed by Chicago Public Schools, Mujeres Latinas en Accion, Alivio Medical Center, UIC Medical Center, DNAinfo.com and City Colleges of Chicago. On behalf of the Urban Public Policy Fellowship (UPPF) program, administered through the Institute for Policy and Civic Engagement (IPCE), in partnership with the African-American Academic Network (AAAN) and the Latin American Recruitment and Educational Services Program (LARES) we would like to thank you for your support and for providing our students with a rewarding experience over the years!